There is a lot of confusing information out there when it comes to teething. When does it start? How long does it last? What’s considered normal? With all these uncertainties, the below should serve as a great resource as a parent’s guide to baby’s teething. Drooling – probably one of the more common symptoms that your baby may be teething is that they’ll suddenly produce a lot of saliva, drooling more frequently than usual. Gum rubbing – if a tooth is trying to erupt through the gums, that can sometimes cause pain. If you see your baby rubbing at their gums, look to see if there is any visible bulging on the gums; that’s likely a tooth trying to erupt. Difficulty sleeping – understandably, if a child is experiencing pain, they may have difficulty sleeping. This shouldn’t cause worry as the pain will reside once the tooth erupts. Ear rubbing – many pediatric dentists have associated ear rubbing with teething. Ear rubbing or grabbing their ears is a common reaction to the discomfort associated with teething, but be sure to check and confirm it isn’t an ear infection or another cause of ear discomfort. 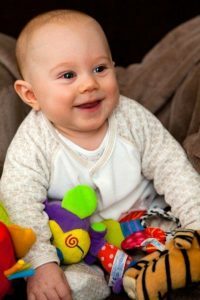 Excessive biting, chewing or sucking – If you notice your baby chewing, biting or sucking more than usual, they could be trying alleviate discomfort. The first teeth to pop up are usually the two bottom front teeth (known as central incisors), followed by the four upper teeth (central and lateral incisors). Since these are thinner with a knifelike edge, they often break through the gums fairly easily and without incident. Molars tend to start coming in around a baby’s first birthday. These are the teeth that may cause a bit more discomfort when they come in due to their size and shape. Here are two interesting facts: girls tend to teeth earlier than boys, and teeth usually erupt in pairs! For the most part, your baby should have their first tooth by around 18 months at the latest. If your child has not yet started teething by then, alert your pediatric dentist or your pediatric doctor so they can confirm there are no other issues delaying tooth formation. Though unusual to not start teething by 18 months, there are children who don’t start teething until much later with no residual dental issues, but check with your doctor to be sure. Teething is an exciting event for every parent. Hopefully having a parent’s guide to baby’s teething will make it a positive situation for you and your baby!